Histidine-rich glycoprotein (HRG) is an abundant serum protein that exhibits many functions in diverse biological systems. In this study, we show that HRG potentiates the ingestion of apoptotic cells by mature human monocyte-derived macrophages (HMDM). HRG bound specifically to apoptotic Jurkat cells and mature HMDM in a saturable and concentration-dependent manner. Purified HRG or HRG in sera increased the number of HMDM-containing apoptotic cells and accelerated the ingestion, while neutralization or depletion of HRG from sera reduced this effect. Anti-FcγRI mAb inhibited HRG binding to HMDM, while DNA, but not chromatin, inhibited HRG binding to apoptotic cells, and either anti-FcγRI or DNA abrogated the HRG-dependent ingestion. The findings indicate that HRG, by acting as a bridge between DNA on apoptotic cells and FcγRI on HMDM, is a key physiological mediator of apoptotic cell clearance by macrophages. Histidine-rich glycoprotein (HRG)3 is a 75-kDa protein found in the blood of vertebrates, including humans (1), and some invertebrates (2). In mammals, the majority of HRG is synthesized by the liver and released into the bloodstream at high rates (t1/2 ∼3 days), maintaining a relatively high plasma concentration of 110 ± 25 μg/ml (1.5 ± 0.3 μM) (3, 4). These findings suggest that HRG, a conserved protein, is important in the biology of both vertebrates and invertebrates. The gene for HRG has been cloned (5, 6), and four different domains with presumably distinct functions have been identified: the N1-, N2-, and C-terminal, and the histidine-rich domains. The histidine-rich domain constitutes 12% of the total amino acid content of HRG and is the most unique feature (7). HRG’s modular architecture with potentially multiple binding sites suggests that it facilitates a multitude of functions by simultaneous interaction with several ligands (8, 9). Previous studies have shown that HRG binds to divalent metal ions (10), heparin (1), heparan sulfates (11), thrombospondin (TSP) (12), fibrinogen (13), and certain complement proteins (14). In addition, HRG binds to a wide range of cells, including inflammatory macrophages (15), erythrocytes (16), fibroblasts (11), T cells (17, 18), and monocytoid cell lines (19, 20). The receptors for HRG on these cells have not been clearly identified; however, inhibition studies suggest that HRG binds to glycosaminoglycans (11, 19, 20) and FcR (19, 20). Although several biological effects of HRG have been described, its precise role in health and disease remains unclear (reviewed in Ref. 21). It has been shown that HRG inhibits precipitation of metal salts, such as Ca2+ (apatite formation) (22), as well as T cell proliferation and adhesion to extracellular matrices (23, 24). Conversely, HRG promotes clearance of AMP deaminase from the circulation (25), cell growth and vessel repair (26), subtratum adhesion of T cells, and homotypic adhesion between cells (17). It also regulates macrophage phagocytosis of opsonized sheep erythrocytes and complement activation (14, 15). Other interesting functions of HRG are inhibition of insoluble immune complex (IC) formation (27), blocking of rheumatoid factor binding to ICs (28), and enhanced binding of IgG1- and IgG2-containing ICs to FcγRI on monocytes (19, 29). In this study, we demonstrate a novel function for HRG, namely its capacity to specifically bind to apoptotic T cells and mature human monocyte-derived macrophages (HMDM), and to potentiate the ingestion of apoptotic cells. Human HRG was purified by passing freshly prepared plasma through a phosphocellulose column, and eluting bound HRG by 2 M NaCl, as detailed previously (29). All HRG preparations were >95% pure, as judged by SDS-PAGE. Purified HRG in PBS was stored at −20°C in aliquots until use. Abs to human HRG were produced in rabbits and affinity purified by HRG Sepharose 4B column. IgG purified from serum before immunization was used as control. HRG-depleted human serum (HRG-DS) was prepared by passing pooled serum through an anti-human HRG IgG Sepharose 4B column, resulting in a decrease in serum HRG level from 1.25 ± 0.11 to 0.023 ± 0.003 μM. SDS-PAGE analysis of the eluant showed a single 75-kDa molecular mass protein representing HRG. Citrated blood from healthy volunteers, collected under the auspices of the Scripps General Clinical Research Center, was depleted of platelets by centrifugation at 300 × g and of T cells by rosetting with neuraminidase-treated SRBCs (ICN Laboratories, Costa Mesa, CA). Subsequent to Histopaque centrifugation, the CD64+ cells in this preparation were purified using a RosetteSep macrophage/monocyte enrichment mixture (Stem Cell Technologies, Vancouver, Canada), according to manufacturer’s instructions. The final PBMC preparation contained ∼95% CD64+ cells. Macrophages were obtained by culturing the CD64+ cells in Teflon bottles (Dynalon, Rochester, NY) at 37°C in 10% CO2 humidified atmosphere in macrophage-specific serum-free medium (Life Technologies, Rockville, MD) supplemented with antibiotics. After 2–3 days of culture, total cell numbers declined by one-half. At day 4, CD64+ cells began to change their morphology, and at day 7, approximately one-half were enlarged 2- to 4-fold and had gained a higher capacity to ingest apoptotic cells. After passage through Histopaque, ∼90% of these cells excluded trypan blue and ∼95% were CD64+. Jurkat cells were cultured in serum-free medium (AIM-V; Life Technologies) supplemented with antibiotics at 37°C in 10% CO2. Cells were routinely cultured at 0.25 × 106 cells/ml and allowed to grow to a maximum concentration of 1 × 106 cells/ml. Apoptosis was induced by 600 rad irradiation, and cells were subsequently cultured for ∼16 h at 37°C in 10% CO2 before analysis or ingestion experiments. Cells were stained with Cy5-conjugated annexin V (AV)-Cy5 (BD PharMingen, La Jolla, CA) and propidium iodide (PI; Sigma-Aldrich, St. Louis, MO); ∼50% were AV−PI− (viable), 15% were AV+PI− (early apoptotic), and 35% were AV+PI+ (late apoptotic). HMDM (50,000 cells) were incubated with different concentrations (0.03–1.5 μM) of HRG in PBS containing 1% BSA (w/v) (PBS-BSA) in Teflon microtiter plates (Dynalon), and bound HRG was detected with FITC-labeled IgG anti-HRG Ab. In some experiments, HMDM were pretreated with a mAb to human FcγRI (IgG1κ) or a matched isotype control (IgG1κ, MOPC-21 mouse myeloma cell line) (BD PharMingen) before addition of HRG. Binding of HRG to irradiated Jurkat cells was examined by incubating the cells with AV-Cy5 and different concentrations of HRG in PBS-BSA and then with FITC-labeled anti-HRG Ab. Cell suspensions were mixed with PI (4 μg/ml), and HRG binding to AV−PI− (viable), AV+PI− (early apoptotic), and AV+PI+ (late apoptotic) cells was assessed by measuring the median fluorescence intensity unit (FIU). Apoptotic Jurkat cells were suspended in 0.15 M NaCl, 4.2 mM MgCl2, pH 7.4, and incubated at room temperature for 1 h with different concentrations of DNase I (Sigma-Aldrich) to achieve 0.195–125 Kunitz U/ml activity. The binding of HRG to DNase I-treated apoptotic cells was assessed as above. Irradiated Jurkat cells were lysed with 1% Triton X-100 in PBS containing protease inhibitors 4-(2-aminoethyl)benzene sulfonyl fluoride and aprotinin (Sigma-Aldrich). Lysates were passed through a HRG-Sepharose 4B column, and bound materials were eluted with 2 M NaCl and analyzed by OD reading, SDS-PAGE, and agarose gel electrophoresis. Calf thymus DNA or chromatin (5 μg/ml; Sigma-Aldrich) was immobilized in Maxisorb ELISA plates (Nalge Nunc International, Rochester, NY) for 1 h at 37°C. The wells were blocked with PBS-BSA and 0.05% Tween 20. HRG at different concentrations was added, and bound HRG was detected with rabbit anti-human HRG, following incubation with alkaline phosphatase-conjugated goat anti-rabbit IgG and color development. The phagocytosis assay was performed as previously described (30, 31, 32) using PKH67 (green fluorescent dye)-labeled irradiated Jurkat cells and PKH26 (red fluorecent dye)-labeled HMDM. These cells were mixed in PBS-BSA at 1:2 ratio and incubated with different concentrations of HRG in 96-well Teflon plates at 37°C in 10% CO2. Ingestion was stopped at different time points by the addition of formaldehyde (3.7% w/v), and the percentage of HMDM-containing apoptotic cells (double-positive HMDM) was monitored by flow cytometry. Data acquisition was performed using a BD Immunocytometry Systems (Mountain View, CA) four-color FACSort (488 and 633 nm excitation), and the subsequent data were analyzed with CellQuest (BD Biosciences, San Jose, CA). Fluorescence measurements were gated based on scatter plots (forward vs side light scatter) to eliminate any debris. Fluorescence of FITC or PKH67 was measured in FL1 (530/30-nm band pass filter), and PKH26 or PI was measured in FL2 (585/42-nm band pass filter). Proper inter- and intralaser compensations were determined using single color controls before each experimental run. The percentage of HMDM-containing/binding apoptotic cells was obtained by plotting PKH26 (HMDM) vs PKH67 (irradiated Jurkat cells), and then obtaining the number of double-positive (PKH26 and PKH67) and total number of PKH26-positive cells by regional gating. In some experiments, HMDM were preincubated with anti-FcγRI mAb (1 h, 4°C) and mixed with apoptotic cells in the presence of HRG at 37°C. In other experiments, apoptotic cells were mixed with HMDM in the presence of normal human serum (NHS), HRG-DS, anti-human HRG-treated NHS, calf thymus DNA (Sigma-Aldrich), or calf thymus chromatin. PKH67-labeled Jurkat cells were incubated with the PKH26-labeled HMDM for 1 h at 37°C. Cell suspensions were fixed with formaldehyde, and the double-positive population was sorted by flow cytometry. Cells were cytospun (Shandon, Pittsburgh, PA) and mounted with ProLong antifade agent (Molecular Probes, Eugene, OR). Images were collected on a Bio-Rad (Hercules, CA) MRC1024 laser-scanning confocal microscope mounted on a Zeiss Axiovert TV-100 (Thornwood, NY). Unpaired comparisons were analyzed using the two-tailed Student t test, with p < 0.05 considered significant. Binding of HRG to CD64+ cells was examined at different time points during in vitro maturation. Specific binding of HRG to fresh CD64+ cells at day 0 was 300 median FIU; however, HRG binding to semimature (4-day cultured) and mature HMDM (7-day cultured) increased to ∼1200 and 3500 median FIU, respectively. Binding was concentration dependent and saturable (Fig. 1⇓A). Scatchard analysis revealed apparent dissociation constants of ∼1000 and 100 nM for semimature and mature HMDM, respectively (Fig. 1⇓B). Binding of HRG to HMDM and apoptotic Jurkat cells. Serial concentrations of HRG were incubated with HMDM or irradiated Jurkat cells (50,000 each) at 4°C. Bound HRG was detected by FITC-conjugated anti-HRG Ab HRG binding to 0-, 4-, and 7-day matured HMDM (A) and to AV−PI−, AV+PI−, and AV+PI+ Jurkat cells (C). Apparent dissociation constants were assessed by Scatchard analysis of HRG binding to 4- and 7-day matured HMDM (B), and to AV−PI− and AV+PI− Jurkat cells yielding straight lines with intercepts at the x-axis of −1/Kd (D). Error bars show the ±SEM of triplicate experiments. The binding of HRG to nonirradiated viable Jurkat cells was negligible (median FIU ∼30, not shown). Flow cytometry staining of irradiated Jurkat cells with HRG, AV, and PI revealed that HRG bound to nonapoptotic viable (AV−PI−), early apoptotic (AV+PI−), and late apoptotic (AV+PI+) cells with maximum 30, 350, and 1400 median FIU, respectively (Fig. 1⇑C). Scatchard analysis revealed apparent dissociation constants of ∼1000 and 100 nM for AV−PI− and AV+PI− cells, respectively (Fig. 1⇑D). The findings indicate that the affinity of HRG binding to early apoptotic cells (AV+PI−) increased by ∼10-fold (Kd from 1000 to 100 nM), while the maximum FIU increased ∼12-fold (from 30 to 350 median FIU). Interestingly, as the cells entered the late stage of apoptosis (AV+PI+), the apparent dissociation constant for HRG remained the same as in the AV+PI− cells (100 nM), but the maximum FIU for HRG binding increased 46-fold (from 30 to 1400 median FIU) (Fig. 1⇑C). 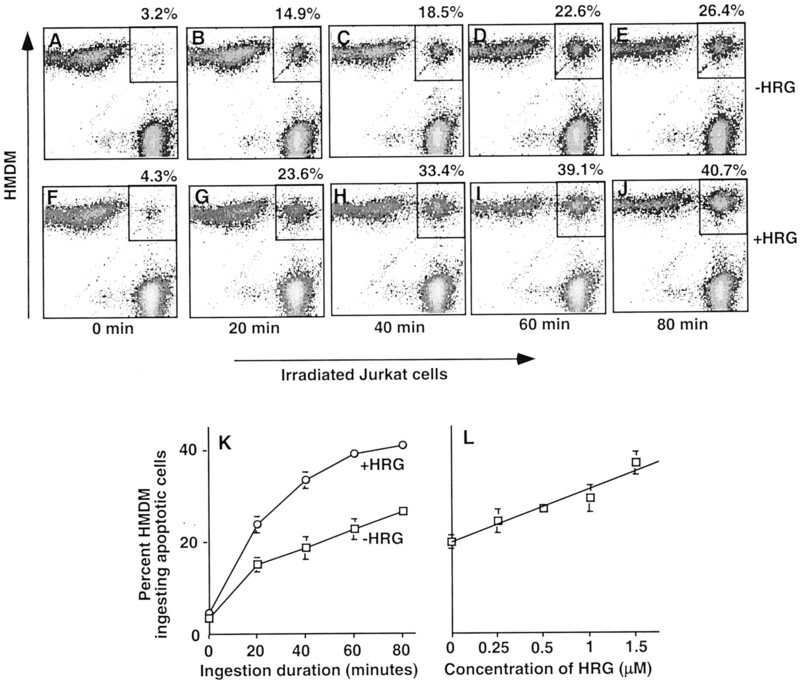 These findings suggest that Jurkat cells gain higher affinity for HRG as soon as they become apoptotic, and HRG-binding receptor(s) increases as the cells enter the late stage of apoptosis. 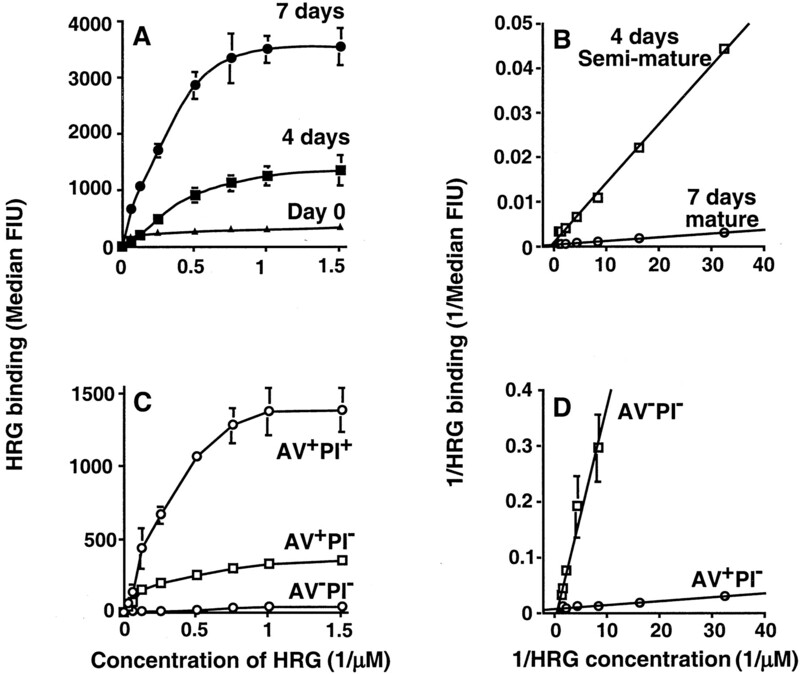 Binding of HRG to apoptotic cells was mediated by cell surface ligands distinct from phosphatidylserine (PS), because preincubation of apoptotic cells with saturating concentrations of AV (a high affinity ligand for PS) did not affect the ability of HRG to bind to apoptotic cells (not shown). To study the effect of HRG on the ingestion of apoptotic cells, macrophages and Jurkat cells were labeled with PKH26 and PKH67, respectively. Binding and ingestion were defined as double-positive HMDM using FACS. 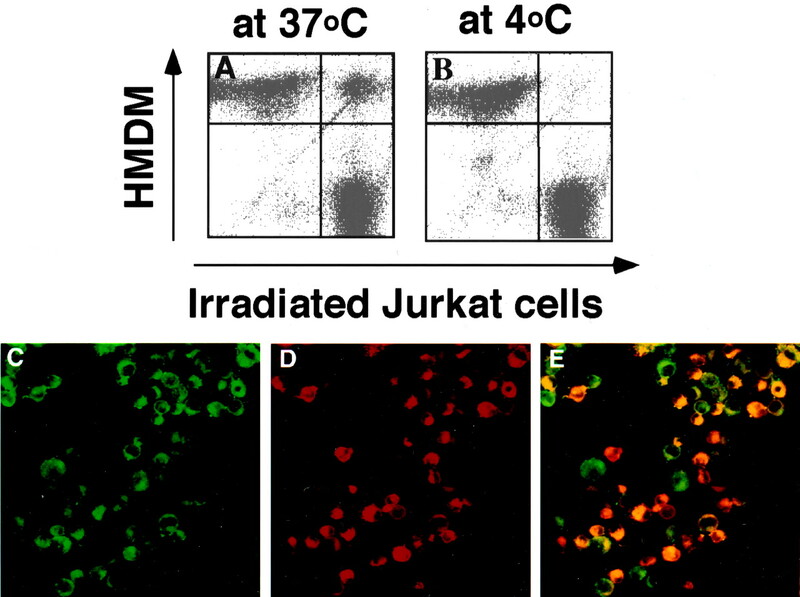 Incubation of apoptotic Jurkat cells with HMDM at 37°C resulted in the formation of double-positive cells (Fig. 2⇓A, upper right quadrant) representing HMDM with ingested and/or surface-bound apoptotic cells. Despite the fact that HRG bound to both HMDM and apoptotic cells at 4°C, no double-positive HMDM were observed at this temperature (Fig. 2⇓B). This demonstrates that movement of receptor sites and multivalent interactions are necessary for sufficient binding and ingestion. The importance of temperature and membrane surface mobility in rosette formation of lymphocytes with opsonized RBCs and phagocytosis has previously been documented (33, 34). Ingestion of apoptotic cells by HMDM. PKH26-labeled HMDM were mixed with PKH67-labeled apoptotic cells (50,000 each) and incubated at 37°C for 1 h. FACS analysis (A) shows three cell populations representing PKH26-labeled HMDM (upper left quadrant), PKH67-labeled irradiated Jurkat cells (lower right quadrant), and HMDM that have bound and/or ingested apoptotic cells (upper right quadrant). B, PKH26-labeled HMDM were mixed with PKH67-labeled irradiated Jurkat cells and incubated at 4°C for 1 h. C–E, PKH26 (red fluorescent)-labeled HMDM were incubated with PKH67 (green fluorescent)-labeled apoptotic cells at 37°C for 1 h. The double-positive HMDM/Jurkat population (in A, upper right quadrant) was sorted by FACS and cytospun. C and D, Confocal images of these cells in the green and red channel, respectively. E, The merge of the two channels. Ingested cells appear yellow. Confocal microscopy was used to ensure that the double-positive HMDM contained ingested apoptotic cells. This population (Fig. 2⇑A, upper right quadrant) was sorted using FACS and visualized (Figs. 2⇑, C, D, and E). The majority of double-positive HMDM contained ingested apoptotic cells and/or bodies (>90%), but some of these cells also had bound apoptotic cells, presumably in the process of being phagocytosed. Substantial high affinity binding of HRG to both mature HMDM and apoptotic cells prompted us to examine the effect of HRG on the ingestion of apoptotic cells by HMDM. PKH26-labeled mature HMDM were incubated with PKH67-labeled apoptotic Jurkat cells in the absence or presence of HRG, and the ingestion was terminated at indicated time points. The presence of HRG resulted in an increased number of HMDM that bound and ingested apoptotic cells at all time points tested (compare Fig. 3⇓, A–E in the absence of HRG with Fig. 3⇓, F–J in the presence of HRG). HRG not only increased the overall number of HMDM-containing apoptotic cells from ∼20 to 40%, but also accelerated ingestion by ∼2-fold (Fig. 3⇓K, p < 0.01) in a HRG concentration-dependent manner (Fig. 3⇓L, p < 0.01). Effect of HRG on the ingestion of apoptotic cells by mature HMDM. Cells were mixed at 37°C in a 96-well Teflon plate in the absence (A–E) or presence (F–J) of 1.5 μM HRG, and ingestion was stopped by addition of formaldehyde at indicated time points. The number of HMDM-ingesting/binding apoptotic cells was assessed by FACS. K, Percentage of HMDM-bound/ingested apoptotic cells (shown in boxes in A–J) was determined using the CellQuest program by (percentage of double-positive HMDM = number of double-positive HMDM (upper right population in box)/total number of HMDM (upper right plus upper left populations) × 100). L, Cells were mixed in the presence of different concentrations of HRG, and the reaction was stopped after 1 h. Error bars in K and L represent mean ± SEM of triplicate experiments. Previous studies have shown that various components of NHS contribute to the ingestion of apoptotic cells, including C1q and TSP (31, 35). Polyclonal anti-HRG Abs reduced by one-half the potentiating effect of NHS on the ingestion of apoptotic cells from ∼40 to ∼20%, while an isotype control Ab had no effect (Fig. 4⇓A, p < 0.01). Similarly, depletion of serum HRG by an anti-HRG Sepharose 4B column reduced HMDM-containing apoptotic cells from ∼38 (NHS) to ∼24% (HRG-DS), whereas addition of purified HRG to HRG-DS restored the potentiating effect of serum (Fig. 4⇓B, p < 0.01). Other investigators (31) have also shown that ∼40% of HMDM ingested apoptotic cells in the presence of NHS. Contribution of HRG in NHS on the ingestion of apoptotic cells. A, NHS was mixed with different concentrations of affinity-purified anti-HRG or control Ab in Teflon bottles and incubated for 1 h at 4°C. PKH26-labeled HMDM and PKH67-labeled apoptotic Jurkat (50,000 each) were added and incubated for 1 h at 37°C. The percentage of HMDM-ingesting apoptotic cells was assessed. B, PKH26-labeled HMDM were mixed with PKH67-labeled apoptotic cells (50,000 each) in the presence of 10% NHS (▵), HRG-DS (□), and HRG-DS containing 1.5 μM purified HRG (○). Ingestion was stopped by formaldehyde at indicated time points, and the percentage of HMDM that bound/ingested apoptotic cells was assessed. Error bars represent mean ± SEM of triplicate experiments. Pretreatment of mature HMDM with different concentrations of anti-FcγRI mAb inhibited HRG binding (Fig. 5⇓A) and HRG-dependent ingestion of apoptotic cells (Fig. 5⇓B, p < 0.01). The level of HRG binding strongly correlated with increased FcγRI expression in immature, semimature, and mature HMDM (Fig. 5⇓, C and D, r = 0.92). A similar increase in FcγRI expression upon in vitro maturation of monocytes has previously been reported (36). The results collectively suggest that HRG potentiates ingestion of apoptotic cells by binding to FcγRI on HMDM. Role of FcγRI on HRG binding to HMDM- and HRG-dependent ingestion. A, Mature HMDM (50,000) were preincubated with anti-FcγRI mAb or a matched isotype control at indicated concentrations before incubation with 1.5 μM HRG. B, Mature PKH26-labeled HMDM (50,000 each) were preincubated with indicated concentrations of anti-FcγRI. PKH67-labeled apoptotic cells were incubated with the Ab-treated HMDM at 37°C in PBS-BSA in the absence (□) or presence (○) of 1.5 μM HRG. C, Monocytes were isolated from healthy blood donors and allowed to mature for 7 days in Teflon bottles. The time-dependent increase in FcγRI expression (open bars) and HRG binding (filled bars) was measured by staining untreated HMDM with (PE-Cy5)-labeled anti-FcγRI Ab or HRG-treated HMDM with FITC-labeled anti-HRG IgG at indicated time points. D, Depicts correlation between HRG binding and FcγRI expression (r = 0.92). Error bars represent mean ± SEM of triplicate experiments. Studies on the isolation of HRG-binding molecules from apoptotic cell lysates revealed that HRG binds DNA, a molecule known to be present on blebs of apoptotic cells (37, 38, 39). HRG bound to immobilized DNA (on ELISA plates) in a specific, saturable, and concentration-dependent manner, whereas the binding to immobilized chromatin, a histone-coated DNA, was nonsaturable (Fig. 6⇓A). Scatchard analysis of these data revealed that HRG bound to DNA with higher (Kd ∼10 nM) and lower (Kd ∼230 nM) affinities (Fig. 6⇓B). HRG binding to DNA and effect of DNA on the HRG-dependent apoptotic cell ingestion. A, HRG binding to immobilized DNA (○) or chromatin (□), as assessed by ELISA. B, Reciprocal plot of DNA-binding data from A to derive the dissociation constants; two binding sites, one with high (•) and another with low (○) affinity, is identifiable. C, HRG preincubated with soluble DNA or chromatin (80 μg/ml each) before mixing with apoptotic Jurkat cells (200,000). The median FIU of HRG binding to AV+PI+ Jurkat cells was assessed by FACS. D, Apoptotic cells (1 million/well) were incubated with DNase I at indicated concentrations, and HRG binding (1.5 μM) to these cells was assessed by FACS. E, PKH26-labeled HMDM were incubated with PKH67-labeled apoptotic cells at 37°C for 1 h in the presence of HRG (1.5 μM) and indicated concentrations of DNA or chromatin. The percentage of HMDM-ingesting apoptotic cells was assessed by FACS. F, DNase I-treated or untreated PKH67-labeled apoptotic Jurkat cells were incubated with PKH26-labeled HMDM in the presence of HRG (1.5 μM). The percentage of HMDM-containing apoptotic cells was assessed by FACS. Error bars show the ±SEM of triplicate experiments. To verify binding of HRG to apoptotic cell surface DNA, HRG was incubated with DNA or chromatin before mixing with apoptotic cells. Calf thymus DNA (80 μg/ml) significantly decreased the binding of HRG to apoptotic cells (p < 0.01), while chromatin had no significant effect (Fig. 6⇑C). HRG column-purified DNA isolated from apoptotic cell lysates gave similar results as calf thymus DNA (not shown). Similarly, cleavage of apoptotic cell surface DNA with DNase I resulted in an enzyme concentration-dependent decrease in HRG binding from ∼1400 median FIU (in untreated cells) to ∼700 median FIU (in 125 Kunitz U/ml DNase I-treated cells) (Fig. 6⇑D). Furthermore, preincubation of HRG with soluble DNA inhibited HRG-dependent ingestion of apoptotic cells (p < 0.01), while preincubation with chromatin had no significant effect (Fig. 6⇑E). Moreover, pretreatment of apoptotic cells with DNase I inhibited HRG-dependent ingestion of apoptotic cells (Fig. 6⇑F, p < 0.01). These results collectively indicate that HRG binds to DNA on apoptotic cells and promotes their ingestion. Several receptors and ligands have been identified as mediators for the uptake of apoptotic cells by phagocytes. This study demonstrates involvement of another circulating protein, HRG. This protein specifically bound with high affinities to mature HMDM and to apoptotic Jurkat cells. By forming a bridge between these cells, HRG increased the number of HMDM-containing apoptotic cells and accelerated ingestion, exerting this function by interacting with FcγRI on HMDM and naked DNA on apoptotic cells. Our results indicate that HRG potentiates ingestion of apoptotic cells at a level similar to other plasma proteins, such as C1q (31) and TSP (35). Previous studies have identified several mechanisms for the ingestion of apoptotic cells by phagocytes, some dependent on the direct interaction of apoptotic cells with receptors on phagocytes, and others requiring bridging between these cells by circulating proteins. Among the direct cell surface receptor-dependent mechanisms are the recognition of apoptotic cells by phagocyte surface CD14, PS, and scavenger receptors (40, 41). Efficient ingestion through these receptors also requires use of additional molecules such as the ABC1 cassette transporters (42), dock 180 (43), and Wiskott-Aldrich syndrome protein (44). TSP and C-reactive protein (CRP)/complement have been implicated in the circulating protein-dependent apoptotic cell ingestion mechanisms. High concentrations (5 μg/ml) of secreted forms of TSP, but not cell surface-anchored or physiological plasma levels (0.06–0.1 μg/ml) (45), were found to potentiate ingestion by bridging apoptotic cells and the αvβ3/CD36 complex on macrophages (35). Acute phase (50 μg/ml), but not physiological (0.5 μg/ml), levels of CRP, when engaged with PS, activate the classical complement cascade and result in the release of C1q and deposition of C3b on apoptotic cells. This, in turn, facilitates apoptotic cell ingestion through a bridging action of C1q or interaction of the C3b-coated apoptotic cells with complement receptors 3 and 4 on macrophages (31). Thus, the TSP- or CRP/complement-dependent apoptotic cell ingestion requires involvement of additional processes such as secretion of high levels of TSP by platelets and macrophages or high acute phase levels of CRP and complement activation. In contrast, because HRG is synthesized by the liver and released into the bloodstream at high basal levels, it is always present at functional levels in the circulation. Thus, an HRG-dependent mechanism mediates removal of apoptotic cells under normal conditions, whereas in pathological conditions, such as acute or chronic inflammatory disorders, TSP- and CRP/complement-dependent mechanisms also contribute. An interesting finding from the present study is the FcγRI dependence of HRG function. FcγRI is the high affinity receptor for IgG Fc, and facilitates the clearance of IgG-containing ICs (46). Recent studies, however, suggest that the role of FcR is not limited to IC clearance, but may have a broader capacity for internalization of other substances. For example, macrophage uptake of zymosan occurs through FcγRs via a bridging action of serum amyloid P component (SAP) and CRP (47). In this study, we provide evidence that internalization of apoptotic cells by macrophages also occurs through FcγRI via a bridging action of HRG. The fact that saturating amounts of anti-FcγRI mAb could partially inhibit HRG binding to mature HMDM also suggests that HRG binds to other ligands on HMDM (presumably cell surface glycoaminoglycans) distinct from FcγRI (Fig. 5⇑A). However, ingestion studies clearly show that a sufficient number of FcγRI on HMDM is a prerequisite for HRG-dependent ingestion (Fig. 5⇑B). Thus, FcγRI may be a major factor in the particle internalization mechanism, perhaps because its ligation results in activation of certain pathways that lead to pseudopod formation (46). In addition, we have previously shown that HRG binds to both ICs and FcγRI on monocytes, and potentiates IC uptake (19). Similar dual actions (e.g., potentiation of ingestion of LPSs and apoptotic cells) have also been reported for another macrophage receptor, CD14 (48). Another interesting finding from the present study is the involvement of DNA in the HRG-dependent ingestion of apoptotic cells. DNA has been detected on the surface blebs of apoptotic, but not viable, cells (37). Exposure of DNA and other nuclear Ags on the surface of apoptotic blebs is thought to contribute to their immunogenicity in certain pathological conditions, such as lupus. In this disease, defective clearance of apoptotic cells has been considered to play a role in its pathogenesis (49, 50). Interestingly, recent studies also indicate that, during apoptosis, histones (H1, H2A, H2B, H3, and H4) are released from chromatin, leading to the formation of naked DNA (51). In this study, we provide evidence that DNA on apoptotic cell surfaces binds HRG and affects HRG-dependent binding and ingestion of apoptotic cells. Thus, it is conceivable that the exposure of DNA on apoptotic cells may provide a signal for clearance by macrophages through the bridging action of HRG. 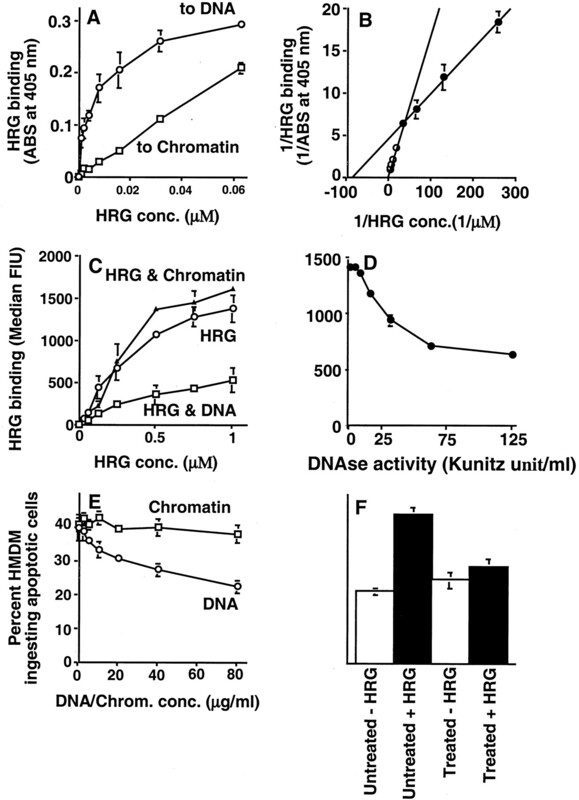 Naked DNA appears to be the major apoptotic cell surface ligand for HRG, because histone-coated DNA in chromatin did not inhibit HRG binding to apoptotic cells and HRG-dependent ingestion. By binding to DNA on apoptotic cell surfaces, HRG may also mask DNA recognition by B and T cells and potentiate its clearance by macrophages. This concept is particularly important, because circulating DNA has been detected at high levels in lupus patients (52). It is noteworthy that other HRG-binding ligand(s) on apoptotic cell surfaces may also exist, because cleavage of apoptotic cell surface DNA resulted only in partial reduction of HRG binding to apoptotic cells (Fig. 6⇑D). Recent studies with SAP (53) or C1q (54) gene-deleted mice of appropriate backgrounds have shown that lack of these proteins promotes the development of lupus-like manifestations. It has been postulated that this effect is due to defective removal of chromatin, ICs, and apoptotic cells (53, 54, 55, 56). Interestingly, HRG binds to nearly all ligands that SAP binds, and can exert functions similar to C1q, i.e., potentiation of IC and apoptotic cell clearance. These findings suggest that physiological levels of HRG, by virtue of its capacity to promote the clearance of apoptotic cells, may also protect from the development of systemic autoimmunity. Future work with HRG knockout mice and mice predisposed to lupus may provide more direct evidence for this possibility. Nevertheless, evidence for low HRG levels in human lupus sera has been reported (57), and our preliminary studies suggest that HRG levels are low in lupus-predisposed strains (BXSB, MRL-faslpr) and decrease with disease progression. We thank the Scripps flow cytometry facility personnel for technical assistance, and M. Kat Occhipinti-Bender for editing the manuscript. ↵1 This is Publication 14402-IMM from The Scripps Research Institute, Department of Immunology. N.N.G. is a Postdoctoral Fellow of the Arthritis Foundation of America. This work was supported, in part, by National Institutes of Health Grants AR39555, AR31203, AG15061, and AR42242. ↵3 Abbreviations used in this paper: HRG, histidine-rich glycoprotein; AV, annexin V; CRP, C-reactive protein; FIU, fluorescence intensity unit; HMDM, human monocyte-derived macrophage; HRG-DS, HRG-depleted serum; IC, immune complex; NHS, normal human serum; PI, propidium iodide; PS, phosphatidylserine; SAP, serum amyloid P component; TSP, thrombospondin. Hennis, B. C., M. P. M. De Matt, P. H. A. Quax, E. J. Le Clercq, J. Kuiper, C. Kluft. 1991. Evaluation of sites of synthesis of histidine-rich glycoprotein. Thromb. Haemostasis 65: 884 (Abstr.). Castel, M., M. H. Horellou, J. Conard, M. Samama. 1983. Immunochemical determination of histidine-rich glycoprotein in healthy subjects and in a clinical population. J. F. Davidson, Jr, and F. Bachmann, Jr, and C. A. Bouvier, Jr, and E. K. O. Kruithof, Jr, eds. Progress in Fibrinolysis 370 Churchill Livingstone, Edinburgh.